Google has done a spectacular job of improving and adding features to Chromecast. The low-cost streaming dongle continues to get better, even as it starts to close in on its 2nd birthday. The latest change makes it possible for Chromecast to receive commands from a TV remote, but it may not work on a lot of older televisions. This means users can finally enjoy the convenience of pausing and resuming with the push of a physical button without first turning on the casting device. This is possible through the use of HDMI-CEC, the protocol that allows multiple devices on an HDMI chain to communicate between each other. Chromecast has been using CEC since launch to turn on televisions (if powered) and take control of routing to set itself as the current source, but there are many other things possible through this interface. The 27946 firmware update to Chromecast added support for "Deck Control" commands (e.g. play, pause, next, etc. ), and passes these instructions on to the currently running app to control playback. Many video and music streaming apps should already support this if they implement the Media Player controls. Unfortunately, while CEC has been around since version 1.0 of the HDMI spec, a lot of older TVs did not implement support the the Deck Control commands. Many manufacturers have also given branded names to their implementation of this feature, like Samsung's Anynet+ and Sony's BRAVIA Link. The only good way to find out if your TV can talk with Chromecast is to simply try it out for yourself. Note: Some TVs may require you to manually enable CEC or detect a CEC-compatible device before this will work. Be sure to try poking around in the menus to find this setting before giving up. Again, the name of this setting may not be listed as CEC, but as a branded name from the manufacturer. It may have taken a while, but it's great that Google is now supporting standard TV remotes. 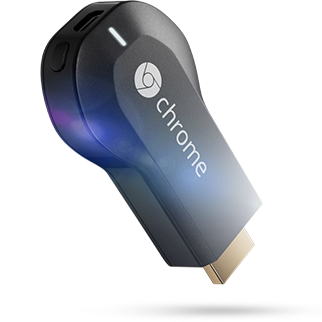 This finally gives Chromecast users a way to break free from the original Casting device.